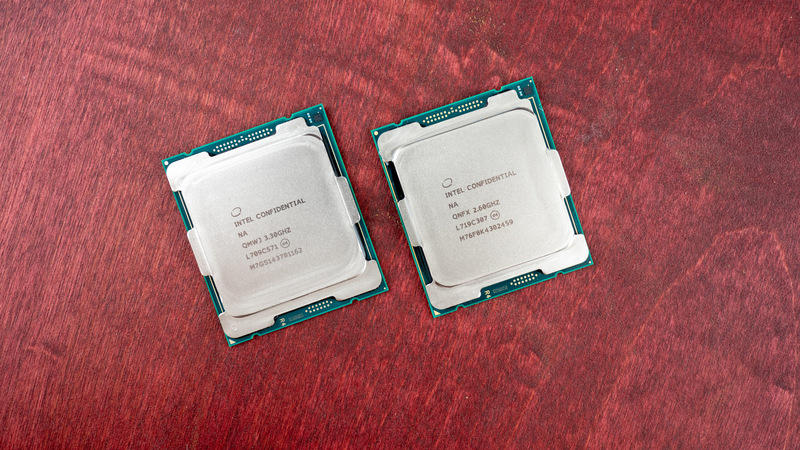 Over the last few years, there has been a ton of newfound competition in the CPU space – reigniting the endless war of AMD vs Intel. Enter Skylake-X, Intel’s answer to AMD’s massively successful Ryzen and Threadripper CPUs. AMD launched its Ryzen processors back in 2017 and it caught Intel by surprise. We didn’t know how Intel would respond, at least at first. There were scattered rumors that Intel would launch Cannon Lake at Computex 2017, but, of course, that didn’t happen. Instead, INtel announced Skylake-X, a line of HEDT processors. And, Skylake-X successfully countered AMD. The Intel Core i9-7980XE was launched at Computex 2017, and while we all saw it coming, we were impressed by the performance, even if it was prohibitively expensive. But, the Intel Skylake-X story isn’t over yet. About a year later, in 2018, Intel announced the new HEDT Basin Falls Refresh processors, like the beastly Intel Core i9-9980XE, based on an improved 14nm architecture, along with a 28-core Xeon W chip to extend the Skylake-X family into 2019 and beyond. Intel released the lower-end Skylake-X processors immediately following their reveal at Computex 2017 with the Core i7-7800X, Core i7-7820X and Core i9-7900X. All of which was released on June 19, 2017. Later, Intel launched three more enterprise processors, with the Intel Core i9-7920X, Core i9-7940X and Core i9-7960X all hitting the streets by September 2017. Later that month, Intel launched the Core i9-7980XE, an absolute unit of a chip that destroyed everything that came up against it. And, now that Kaby Lake-X chips are a thing – or, were a thing when they died unceremoniously – you might be thinking to yourself that all the fun ended with the 7980XE. However, Skylake-X isn’t dead yet. Intel also announced a Skylake SP 28-core server chip, which would later be christened the Intel Xeon W-3175X, back at Computex 2018. Intel’s newest addition to this family was officially announced on October 8, 2018 and release in February 2019 to dethrone Threadripper 2nd Generation. The biggest thing holding Intel Skylake-X chips from an easy recommendation is their price – they’re some of the most expensive consumer CPUs you can buy today. If you want to pick up a Core i9 processor for your latest build, you might actually need to sell your car first, as they start out around $999 (about £750, AU$1,340). Now, the Core i7 Skylake X processors are a bit more reasonable, but you’re still paying to adopt a high-end platform, so don’t expect to base a budget build off of Skylake-X. 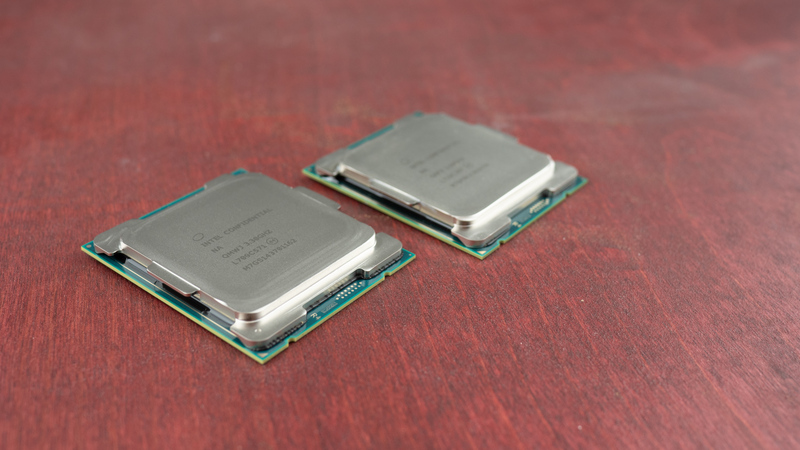 Below you can find the pricing for all of the Skylake-X processors currently available. We also finally know that the 28-core A-series chip is going to be extremely expensive – if you want to get your hands on the Intel Xeon W-3175X, you’re looking at $2,999 (about £2,330, AU$4,250). Get ready to drop at least $10,000 if you’re planning on building an equally powerful rig around this chip. Intel newest Cascade Lake chip, the Intel Xeon W-3175X, seems to be beyond the realm of these other Skylake-X HEDT chips. With a name like Xeon, this CPU is designed for more enterprise usage than enthusiast overclocking. 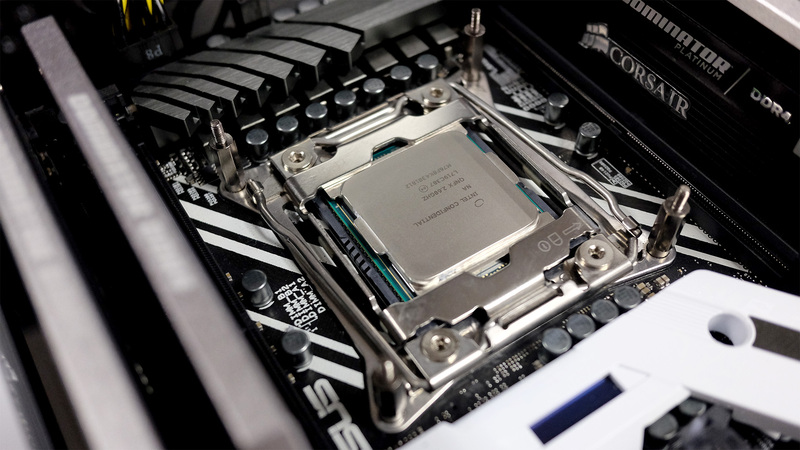 Although the chip first debuted at Computex 2018 with a 5.0GHz boost clock, it was later revealed that Intel was actually overclocking while immersing the processor in liquid-nitrogen. Without an extreme setup, you&apos;re more likely to see this chip running at a maximum of 4.3GHz. However, the next actual HEDT processors lie within the Basin Falls Refresh lineup. Chips like the Intel Core i9-9980XE are positioned to take on the Ryzen Threadripper 2990WX and Threadripper 2970WX. And, while it is faster, it’s still hard to justify the high price. Intel newest Skylake chip, the Intel Xeon W-3175X, is beyond the realm of these other HEDT chips. 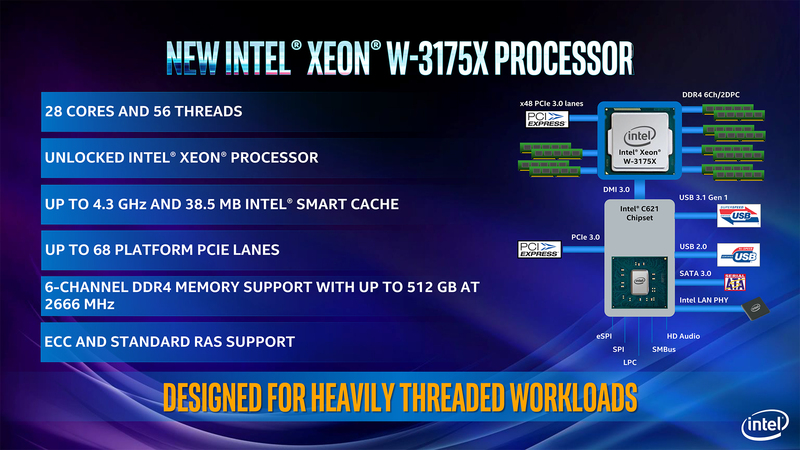 With the Xeon name, this CPU is designed for more enterprise usage – think 3D animation – than enthusiast overclocking. Although the chip first debuted at Computex 2018 with a 5.0GHz boost clock, it was later revealed that Intel was actually overclocking while immersing the chip in liquid-nitrogen. We finally have the final specs, and it looks like the Intel Xeon W-3175X will have a core clock of 3.1 GHz, with a boost of 3.8GHz across all 28 cores and a 4.3GHz single-core turbo clock. And, with the new Intel C621 chipset, this CPU comes with a greatly expanded support platform. This chip supports 68 PCIe lanes, 6-channel memory for up to 512GB of RAM running at 2,666MHz. Intel newest Skylake-X chip, the Intel Xeon W-3175X, seems to be beyond the realm of these other HEDT chips. With a name like Xeon, this CPU is designed for more enterprise usage than enthusiast overclocking. 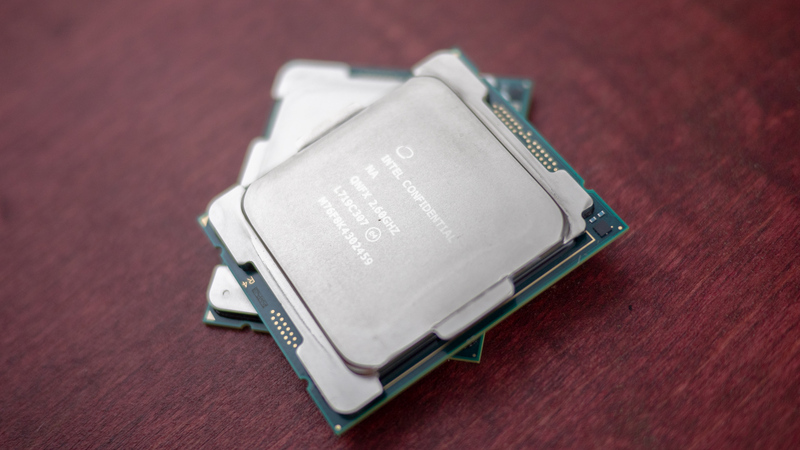 Although the chip first debuted at Computex 2018 with a 5.0GHz boost clock, it was later revealed that Intel was actually overclocking while immersing the chip in liquid-nitrogen. Without an extreme setup, you&apos;re more likely to see this chip running at a maximum 4.3GHz. Although Intel has yet to reveal a new chipset for the Xeon W-3175X, this CPU comes with a greatly expanded support platform. Team Blue has said the chip will support 68 PCIe lanes, 6-channel memory for up to 512GB of RAM running at 2,666MHz. All told, this maybe the processor to finally outpace the Ryzen Threadripper 2990WX and Threadripper 2970WX.